When Missouri is going through its annual freeze/thaw cycle, the trails are too muddy, or it's just plain wet out - turn to the trusted pre-industrial revolution technology - gravel! This section is not a comprehensive list of gravel-based routes. This brief list is to whet your appetite and get you fired up and exploring Missouri's back roads, fire roads and abandoned logging paths. 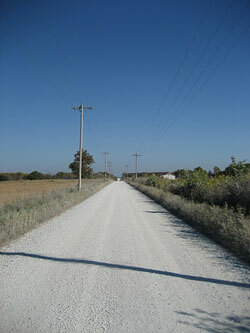 In order to jump start this section the super popular gravel rides in St. Charles will be detailed below. But remember, the massive Mark Twain National Forest and many, many roads just an hour or two outside St. Louis beckon your wheels when the weather is foul, the trails are mud and adventure or endurance training must be accomplished. Here's Missouri's own gravel grinding event blog. Get your gravel ride on! Missouri Map Resources to Assemble Your Gravel Mega Route! Mark Twain National Forest - Road Usage Maps! This is a great start to a long relationship with the DD/32 gravel nexus of the universe. Download resource-intensive PDF maps from US Forest Service. This screen shot below is taken from the Salem/Potosi Unit dated September 15, 2011. This particular map contains most gravel roads around the Middle Fork / Council Bluff / Trace / Bell Mountain area. As detailed as this map is, you may find some roads are not listed. That's when you turn to GPS file centers like GarminConnect and MapMyRide to fill in the missing pieces. Before long, you'll find yourself to be a gravel expert AND mapping guru. These files are not hosted by GORC as they are subject to updates without our knowledge. 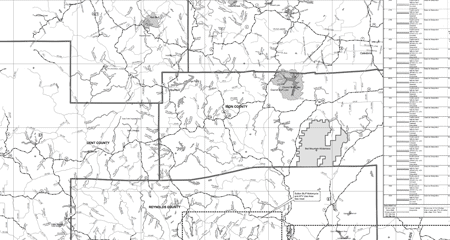 The Missouri Department of Transportation has printable maps of Missouri's 114 counties. The documents are provided in Adobe PDF format with dimensions of 18 by 29 inches. The county maps are a great way to discover new roads and their classification.